I never realize how often or how little I see certain colors until the color challenges. It really makes me see the world through a different set of eyes. That’s the point though, no? Don’t worry. I stayed away from the orange flowers. I figured I’d end up going this route but to be completely and utterly honest: I dig it. I dig the angle, the blue sky, the buildings in the background, all of it. The colors were bright and vibrant but I decided to play with layers and desaturate the image because the orange sign was so “WHOA!” and I’m not a big fan of orange and well, I changed it to my liking. That’s how I roll. Now next week’s subject is “smile”. I’m hoping to see a lot of faces but I think that we can find smiles in almost anything. Remember, it’s all about how you interpret the subject – there are no boundaries of the imagination. Just have fun with it. 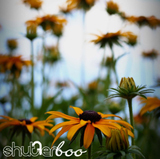 ~ by shutterboo on April 14, 2010.
i’ve become the biggest swpc challenger. luckily i’ve got something orange in my arsenal. fingers crossed i can pull a photo together from it. i like your orange. and really love the post processing. adds a nice depth to it.